- Malaysian citizen who has graduated or full-time student who has obtained admission to pursue or currently pursuing studies at universities which are established or registered under the laws regulating such establishment or registration in Malaysia or authorized by any order made under Section 5A of the Universities and University Colleges Act 1971. - Good academic results. Record of active participation in extra curricular activities is added advantage. - Individual with high energy who seeks a challenging rewarding career ipon registation. - Must not be a recipient of any other scholarship or award from other organisations or foundations or is bonded by any educational institution or organization. - Successful applicants will have to enter into an Agreement to serve the Company for a specified period of time upon graduation. No. 5, Persiaran Tasek, Tasek Industrial Estate, 31400 Ipoh, Perak. 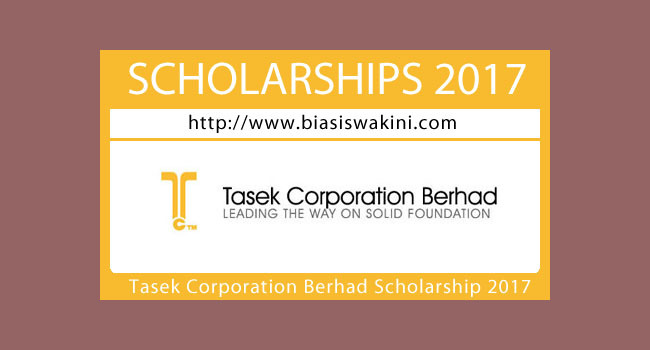 0 Komentar untuk "Tasek Corporation Berhad Scholarship 2017"